Crazy month of October has meant some crazy weather and a cold. I rarely get sick but when it hits it never seems to go away! It means I needed super reliable, cold proof make up items, and some TLC for my skin. 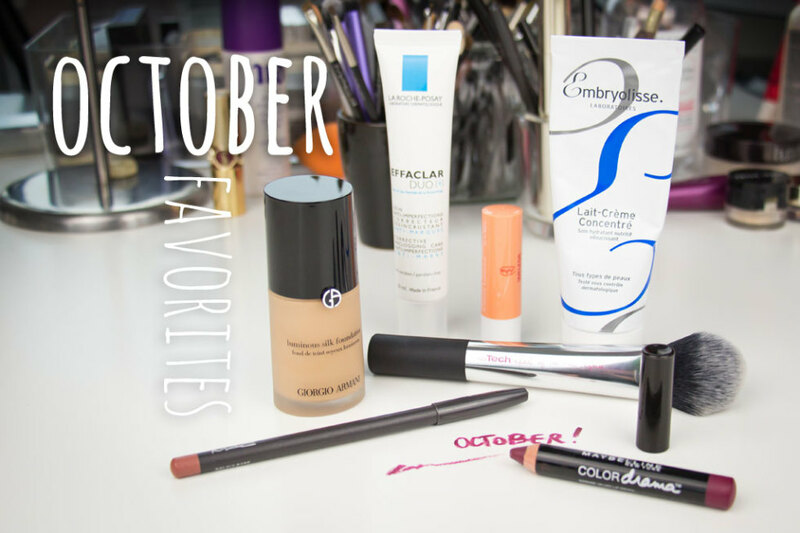 So inspired by random weather and a cold my October monthly favorites are here! This my all time October winner. I raved about this foundation in a recent review and I think that there is nothing more that I can say about it apart from the fact that I love, love, love it! In the Netherlands you can order it from de Bijenkorf. Again another one I recently reviewed but combined with the Armani foundation it gives my skin the most amazing airbrushed quality. I then wipe it down (the brush, not my skin) and use it to apply blush for the perfect flush. I love the versatility of it and love the fact that it just does that bit of extra work in perfecting my look. Aan oldy but a goody, with the weird weather, one day warm, the other day cold, then the wind then rain, and my cold, my skin was all confused and in need of TLC. One layer of this, as a mask in the evening just seems to give my skin all it needed and I would wake up with perfect skin the next morning! I also love to apply it as my moisturizer on the days when I don’t wear make up, weekends mostly. I don’t use it every day though because it is a bit too rich and makes my T-zone oily. I got mine on Douglas.nl, but Cult Beauty is another good source (although quite a bit more expensive). I did a major switch in my skin care routine in the neighing of this month, I changed everything from the AHA peel I use, to the moisturizer, I introduced a new foundation. My skin, while not sensitive, does not like change at that scale and although it is now the best skin I have had in a while, in the first week of the switch it had gone all weird on me. In to save the day – Effaclar Duo. I never really thought that a cream could be such am miracle worker when it came to calming break outs, disappearing them in a day or two and leaving flawless skin. I use it as a treatment, and mostly just spot apply it on the trouble area, mostly my chin. I think that because I don’t have skin prone to breakouts it is too drying to use allover and to use every day, but as a treatment it is a miracle worker and I could not recommend it enough. You can buy this in most pharmacies. I never really liked to use lip pencils, I found them too drying and unless I was applying red lipstick I would never bother with them. What makes this lipliner great for me is the color, I wear it over balm with a bit of gloss on top, I wear it with my vast collection of nudes, it blends seamlessly into my own lip color and I never want to be without it! 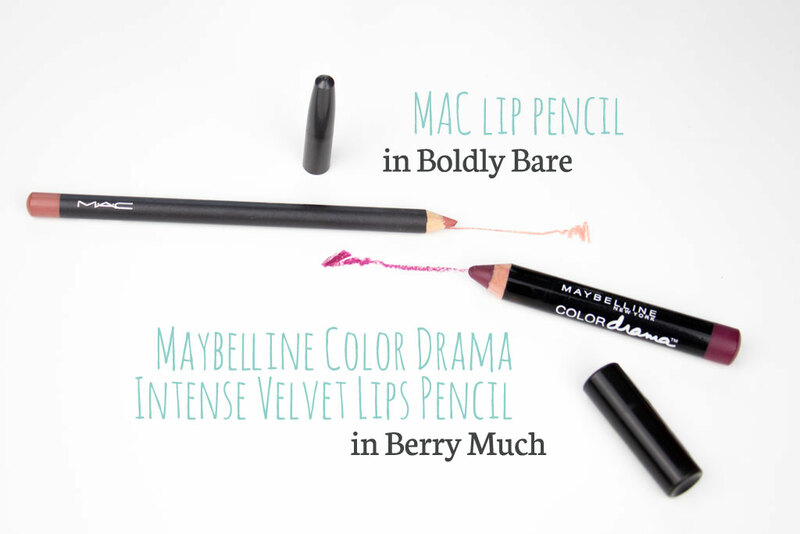 You can get it at your “local” MAC website, although I have to say that the color swatch is completely different to the actual lip liner color! Now this thing ticks all the right boxes, it is a lip stick in a pencil, so no need to hassle with two products, it is compact and light so great to use on the go, the color is a most gorgeous wine/plummy deep red and the texture is effortless. You can layer it on for full on dark lips, or you can apply a thin layer and pat in with your finger for a more stain effect. I love it either way and this has been my go to dark color in the month of October. Best thing about it? Its drug store, affordable and available just about anywhere! You can get this at almost any drugstore. My all time favorite lip balm ever. It is all natural, very nice and creamy (although it is beeswax based). It also has jojoba oil and shea butter. I apply this every night and every morning, and on days when I am not using lipsticks it is all I wear. I love the scent which is very natural and honey like. Yeah it is a bit of a surprise isn’t it. When was told to use it (by a well know Croatian make up artist) I didn’t really think that it would be right for me, way to rich and oily. But from first application I was converted!